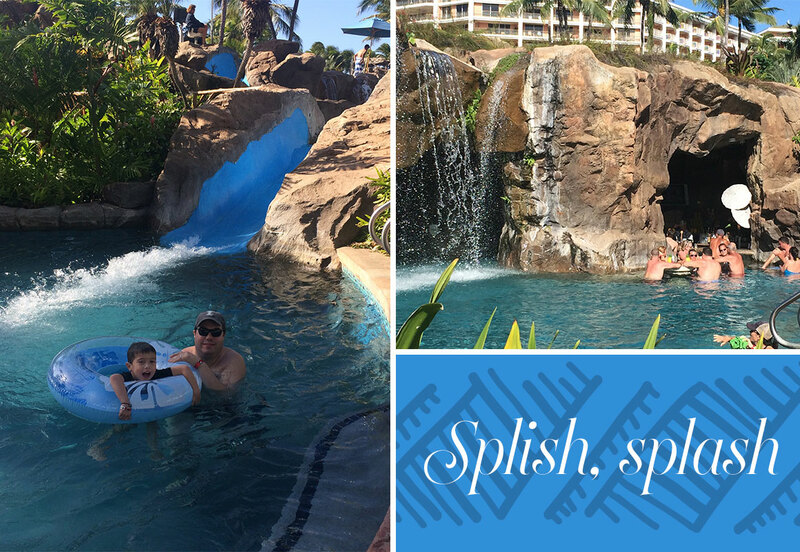 I spent a week this past January with my husband and our four-year-old son at the Grand Wailea—a Waldorf Astoria Resort on Maui. This wasn’t the first time we stayed there, and I promise you it will not be the last. We love the Grand Wailea Resort. It’s the perfect place for traveling to Hawaii with kids, providing luxurious Hawaiian ambiance with endless cultural experiences. 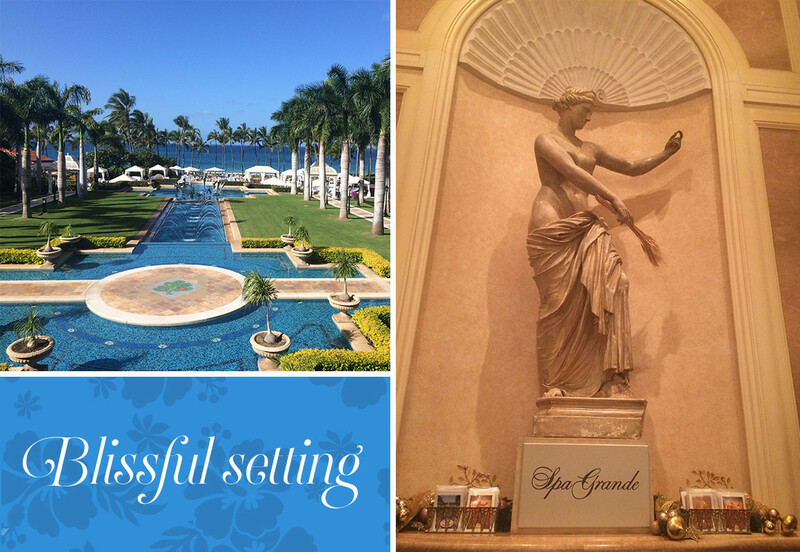 Read on to find out what keeps drawing us back to the Grand Wailea, year after year. 1). Embrace the Hawaii of dreams. When we arrive at the Grand Wailea, greeters meet us with luscious leis and yummy POG—a blended juice drink first created in Maui in the 1970s. The drink contains passion fruit, orange, and guava juices, and my son Harry can never get enough of it. As we go through the check in process, the surrounding scenery transports us to another time and place. The lawns are bright green and perfectly manicured, and waterfalls cascade down rock edges. I relax instantly, and see the same in my son and husband after a long day of air travel. 2). Stay in true luxury. The exclusive Napua Tower becomes our home-away-from-home at the Grand Wailea. Rooms feature spacious marble bathrooms and private lanais, complete with stunning views of the ocean and gardens. We also get to enjoy complimentary continental breakfast in the private lounges each morning (a Harry favorite). On our most recent trip, armed with the camera his cousins gave him as a gift, Harry loved snapping pictures of his complimentary breakfasts. In the early evenings, we relax with complimentary cocktails and hors d’oeuvres— the coconut shrimp, cheese plates, and mai tais making the list of my personal favorites. The staff goes so far as to make decadent kiddie cocktails, too, so even the little ones get to experience one-of-a-kind vacation drinks. And in between breakfast and cocktail hour, I love relaxing with hydrotherapy and other east-meets-west wellness services in the Grand Wailea’s Spa Grande. I visited three times on our most recent trip, and loved sitting on the lanai overlooking the resort at the end of my treatments. There’s nothing like it! 3). Explore beautiful pools and private beaches. The Grand Wailea’s pools and surrounding beaches are incredibly special, lined by walking paths and luscious grounds. The main pool consists of a series of lagoons connected via waterslides, which feed into a lazy river. We love to work our way through the entire succession as a family, ending with a cocktail at the lazy river. Our family also loves to play on the pristine Wailea Beach. Wailea is prime Maui, the Beverly Hills of Maui. When you see photos of celebrities playing beachside in Hawaii, they’re often on Wailea Beach—because the beach has less public access than other Maui spots. And it’s amazing to relax on such an intimate beach in the center of this sprawling resort. If your kids are older than five, you can also enroll them in the Grand Wailea’s kids club while you and your partner indulge in an afternoon at the adults-only pool. 4). Experience the best of Maui. Close to shopping, all the top restaurants, and fantastic day-adventures, the Grand Wailea makes for a great jumping off point when you want to leave the grounds and explore the broader island. If you’re not sure where to start, check out our top 5 best restaurants in Maui. Whether you’re in the mood for a tiki vibe or waterfront views, there’s something for everybody. We last visited in January, right at the beginning of whale watching season in Hawaii. Harry spotted whales—mamas and babies—as we sat on the beach, but we opted for a close-up whale watching boat adventure with the Pacific Whale Foundation. The staff was incredibly friendly and knowledgeable; you don’t want to miss it! When you book your trip, I tell all my friends to schedule more than a few days. Trust me, you’ll want to stay for a while, there’s so much to do. And when you get back, share your favorite experiences here. I’m always on the lookout for our next great Hawaiian adventure.